AMAZON IS AN INTERNET RETAIL GIANT! SO WHY NOT USE THEM TO REACH MILLIONS OF CUSTOMERS? Now you can sell tons of products on Amazon without any datafeeds! Just create a list of items and push them in bulk to Amazon with just 1 click. Then wait for orders to come in... It's really that easy! Our Amazon plan will handle the import of thousands of products, and the daily inventory updates automatically for you. Our system will even send the tracking codes back to your Amazon account automaticaly right after your order is shipped. Our new Amazon push tool will help you import thousands of dropship products to your Amazon Professional Seller account with truely just one CLICK! You won't have to worry about manual handling CSV files every day to keep your products up to date. Just build your list of preferredd items and turn ON your list and wait for sales to come in. After you turn ON your list, our Amazon plan will automatically import and update your Amazon account with proper inventory changes for each of the products on your list, so you won't have to worry about selling products that run out of stock. Currently we impose a limit of 5,000 products per account (an upgrade is available). A limit is imposed to avoid having too many people flood the Amazon marketplace with the same products. This limitation will give everyone a chance to build a good list of products while enjoying a steady flow of orders. AS THEY SAY... THE PROOF IS IN THE PUDDING!! To be clear, our Amazon account was brand new with no history of sales. Well, in 2 months only we generated $5,175.47 in gross sales. "Amazon is a wonderfull place to sell and I encourage everyone to give it a honest try. As a BONUS, I will include a link to my Tips & Recommendations for selling on Amazon. This will include step by step instructions on how to use our new Amazon Dropship Plan as well as clear instructions on how we configured it to avhieve the sales results shown in the screenshot above." How do I get paid for the item I sold on Amazon? Amazon will capture the payments from your buyers for you. Once you have processed the order and once the tracking code is provided to Amazon, they will deposit your profits into your Bank account. When you first signup for a Professional Amazon Seller account, you will be guided on how to link your account with your Bank so Amazon can deposit your profits. Do I need to send tracking codes to Amazon? One of the main advantages of our Amazon Dropship Plan is that we automate the import of tracking codes to your Amazon account. This means that tracking codes will be sent to your Amazon account as soon as they are provided by the supplier, thus you will avoid any delays. As you know Amazon is very rigorous when it comes to shipping on time, so this feature will certainly help you keep Amazon happy at all time. What type of Amazon account do I need? You will need to signup for a Professional Amazon Seller account. Amazon offers a free 30 days trial so if you don't have an account already, simply signup for a Professional Seller Account by clicking on the Sell As A Professional button. Can I control the prices? Yes absoutely. You will be able to control the prices of items on your list with a global markup or by changing prices of items individually. 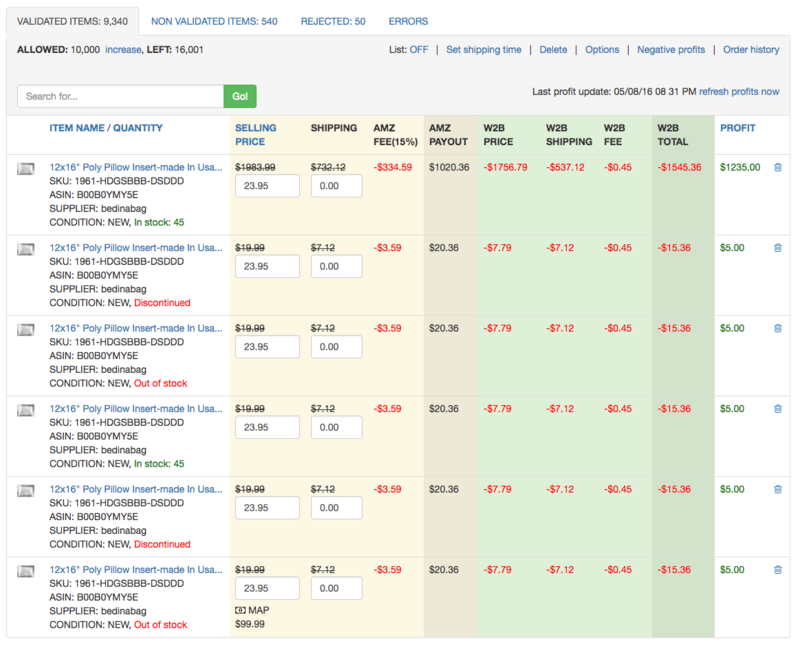 You will also be able to choose from various markup methods so you can fine tune the prices as you wish. We will help you with each return request. You simply need to inform us of the order number and the reason for the return. We will also need to know if your buyer wants a refund or if your buyer prefers to return the item for an exchange. Our team will then contact the supplier to get a RMA number along with the return address which we will pass on to you. You can then inform your Amazon buyer to follow the same instructions and a refund will be issued as per the supplier return policy once the item is received at their warehouse. How can I forecast my profits? Once you have setup your markups and made changes to your prices, you will be able to see your estimated profits in your main list. You will also be able to sort your list by profit and apply bulk changes to fine tune your selling prices to meet your profit goals. This feature is great because you will immediately see which items will yield positive profits and which ones will yield negative profits, in which case you can make an immediate change on those prices to address the issue. Which country should I sell to? Currently our Amazon plan is for USA and Canada Amazon accounts only, so with this plan you will only be able to sell in the USA and Canada. We can help you with orders in the USA and Canada. If you want to ship to other countries you will need to process your orders directly with the suppliers. Why can I only load products listed under the Amazon section? Not all our integrated suppliers provide UPC codes, which are requried in order to find products on Amazon. When you sell on Amazon you can only pick products from our list of suppliers that have UPC codes. This is the reason why not all items are available, however you can easily browse products by Amazon products only so you can quickly narrow down the products with UPC codes only. UPC codes are universal code numbers used throughout the markplaces however Amazon uses its own internal item numbers referred to as ASIN numbers. Amazon will try to match the UPC codes of your imported products to its own database of products to locate the corresponding ASIN number which is then used to display the item name and image. Occasionally Amazon will mistatch the UPC with the wrong ASIN number which can results in problems with pricing. B) You will also have the ability to validate your list of items by comparing items from your list with the Amazon product images and item names as matched using the UPC code.